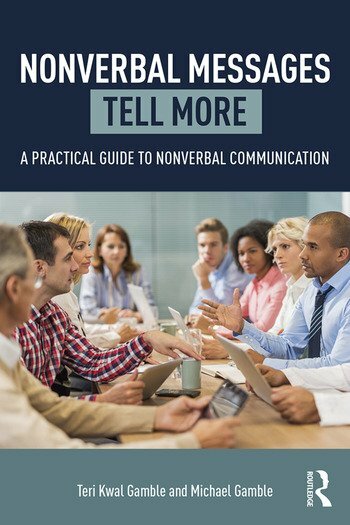 Nonverbal Messages Tell More: A Practical Guide to Nonverbal Communication offers an active and dynamic approach to the study of nonverbal communication. The study of nonverbal cues and messages is a difficult undertaking, but Teri and Michael Gamble have put together a volume that approaches the field from a variety of perspectives. Nonverbal Messages Tell More bridges the relevance gap by making the text more accessible and interesting to students of all levels. It does so by highlighting examples of nonverbal behavior taken from popular culture including film, television, and broadcast and print news. This volume provides a thorough overview of the classic and contemporary research and theory for nonverbal communication. It contains a number of features, including experiential guidelines and activities that give students better self-insight and understanding of the nonverbal messages other individuals display. At the end of every chapter are a series of follow-up investigations designed to demonstrate mastery of the content and the ability to apply what was just learned. Nonverbal Messages Tell More also presents the necessary know-how for presenting oneself using nonverbal cues that encourage others to perceive you as personable and credible. It leaps ahead of other books on the subject by offering students an engaging, practical, and useful introduction to the study of nonverbal communication. Teri and Michael Gamble both earned Ph.D. degrees in communication from New York University. Today they are full professors of communication, with Teri at the College of New Rochelle in New Rochelle, New York, and Michael at New York Institute of Technology in Manhattan. The Gambles are professional writers of communication textbooks and as such have co-authored many books designed to engage college students in learning, including The Public Speaking Playbook (SAGE, 2016), Communication Works 11th edition (McGraw-Hill, 2013), Interpersonal Communication (SAGE, 2013), The Gender Communication Connection, 2nd edition (M.E. Sharpe, 2013), and Leading with Communication (SAGE, 2013). Every semester, Teri and Michael teach on campus and online classes for graduate and undergraduate students.